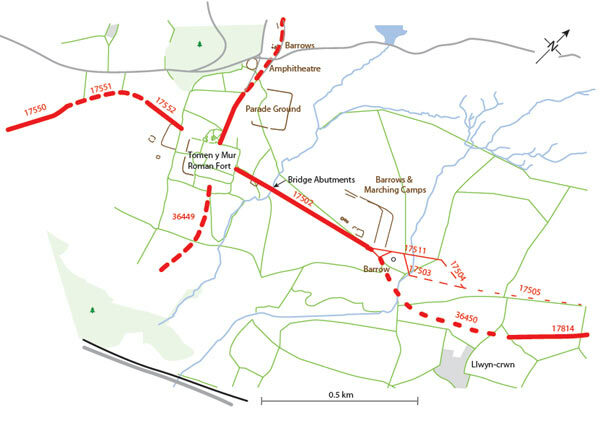 A project seeking to examine the Roman roads of Gwynedd was initiated in 2002/03 as part of a wider pan-Wales programme of work examining various aspects of Roman military remains in Wales (G1632 Roman Fort Environs). The first year of the project consisted of scoping and examining the extent of the available data (GAT report 497 Roman Fort Environs 2002/2003 Appendix 1). The second year, 2003/04, adopted an approach set out by CPAT in Roman Roads in Mid and North-East Wales (Report 527, 2003). The 2003 to 2007 phases of the project involved a desktop assessment of existing records and other sources, GIS mapping of the known and suspected roads in the region and the production of a report. The final report, Roman Roads in North-West Wales, (GAT Report No. 668, 2007) illustrates the current state of knowledge, provides a hard copy of the GIS data and highlights where further work in both documentary assessment and fieldwork is required. The GIS/database information has been compiled in a format that can be accessed alongside core Historic Environment Record data in MapInfo thus allowing access to detailed information about the form, condition, survival, status (level of confidence in the route), and physical details of each stretch of road or proposed road. All of the major known and projected routes have now been assessed and mapped and the data is now accessible via the regional Historic Environment Record. This is the first time that detailed information about the Roman roads of Gwynedd has been available in an accessible format and this now ensures that meaningful planning and management advice can be provided for this class of monument. A summary of the findings of the pan-Wales project were published in Roman Frontiers in Wales and the Marches (Burnham and Davies editors, 2010) but little detail of specific roads was included. The data from the project can currently be accessed via the HER. Roman roads continue to hold a fascination for amateur and professional alike and GAT continues to receive many queries about details of the roads. The current project aims to present the large amount of information generated by the original Roman roads project in a user friendly and populist fashion. The current large two-volume report contains many maps and all the data in the HER. Many road alignments, however, remain conjectural and unproven in detail and an only a relatively small amount have significant extant archaeology. The aim of this project is to summarise the most interesting and relevant information in a short guide book. This will contain a series of general maps illustrating the route of each individual road, along with a selection of detailed maps showing extant archaeology. The text will provide background information, detailed descriptions where appropriate, along with references and ideas for further research. It will be designed to appeal to a wide audience including casual readers, schools and the serious student of Roman roads. 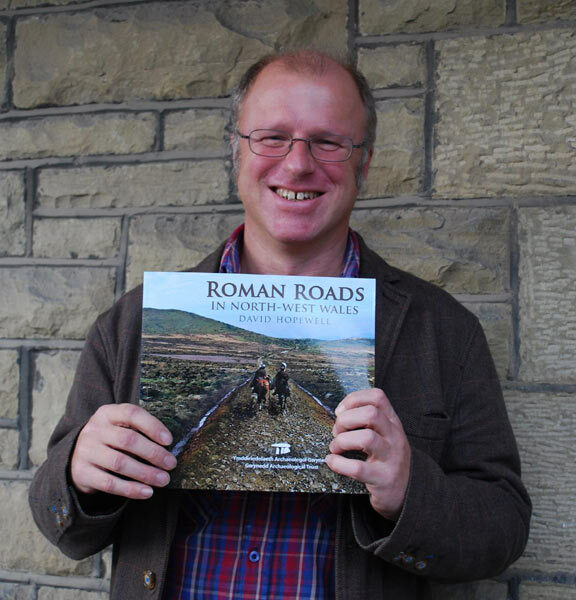 This will be the first comprehensive account of Roman roads in north-west Wales since Margary's Roman Roads in Britain (various editions from 1955 to 1973). A small amount of new research was carried out. This consisted of follow-up field work in response to discoveries of Roman roads on Environment Agency lidar survey by Bryn Gethin, Hugh Toller and John Burman. Several potentially important alignments have been discovered and brief field visits to update the project and HER records were carried out. These have confirmed, as far as is possible without excavation, that the features revealed by lidar are low aggers degraded by agriculture. The two volume Roman Roads in North-West Wales, (GAT Report No. 668, 2007) was edited, and in some cases expanded upon, to produce the text for publication. All new discoveries were integrated and a series of maps were produced. Four show a large scale representation of the roads and a further 27 detailed maps show all of the lengths of extant road in Gwynedd. The text and maps are supplemented with aerial and ground photographs, and section drawings. The text has been reviewed by Hugh Toller and local Romanist Bill Errington. The final layout will be produced by Robert Williams from Llyfrau Magma and the book will be published by Gwynedd Archaeological Trust in time for Christmas 2013. The information will also be available online either through the RCAHMW People's Collection or via the Gwynedd Archaeological Trust website. Three outreach events in the form of guided walks and Roman road identification workshops were carried out as part of Gwynedd Archaeological Trust's Discover Gwynedd's Archaeology guided walks programme. This was carried out with additional funding from The Countryside Council for Wales, which funded the publication of leaflets, along with additional preparation and publicity. These events replaced a proposed outreach event at Tomen-y-mur in conjunction with the Snowdonia National Park which was cancelled due to access problems.